This dish from Catania is usually made with Ricotta Salata cheese. The semi-hard salted ricotta gives it a distinctive flavor and should be available in specialty shops and some supermarkets. If need be, substitute pecorino for it, it will not be the same, but still delicious. Alla Norma after the composer Bellini’s (born in Catania) Norma. Place on paper towels to drain. Heat the olive oil in a large skillet. Brown eggplant slices on both sides. Alternatively, brush both sides of slices with olive oil, place on cookie sheet, bake in a pre-heated 450º F oven for 15 minutes or till nicely browned. Cut slices into cubes or leave whole. Heat 2 T olive oil in a pan. Add onion and sauté till golden. Add garlic and sauté for 1 or 2 minutes. Add the tomato, fresh oregano, peperoncino and basil. Raise heat so sauce cooks at a fast bubble. Cook about 10 to 15 minutes; do not allow sauce to dry out. While tomato sauce cooks, bring water to a boil. Cook pasta and drain when done. Place in a bowl, pour tomato sauce and 1/4 cup cheese and mix. Add eggplant and toss again. 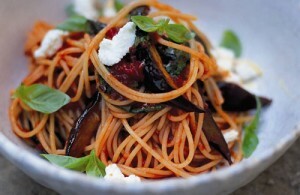 OR Leave eggplant slices whole placing them on top of the pasta dressed with the tomato sauce.